signed and on verso titled twice and inscribed 'Lady Banting' on the Hart House exhibition label and inscribed "155"
Scientist Frederick Banting was internationally renowned for his discovery, along with Dr. Charles Best, of insulin, used to treat diabetes. But Banting also had an attraction to art, and he believed that scientists were also creators. He joined Toronto’s Arts and Letters Club, a ferment of artistic exchange, where he met Group of Seven artist A.Y. Jackson. They became friends and went on sketching expeditions together. Banting enjoyed the opportunity to escape the formality of his university research environment and immerse himself in the heady atmosphere of camaraderie, nationalist enthusiasm for the landscape, and adventure of painting in the outdoors that were part of the Group experience. 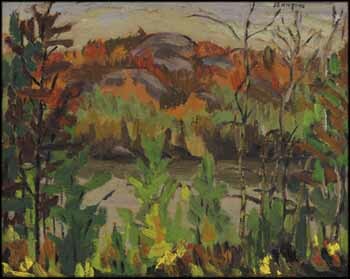 Banting was known to have sketched with Jackson in the French River area of Ontario (from Lake Nipissing to Georgian Bay) in 1930 and 1934. This vibrant autumn scene with its view through a screen of trees across the river to the hills beyond is a subject typical of Group compositions, and Banting's bold brush-strokes, simplified shapes and rich palette show how thoroughly he understood the breakthroughs in landscape painting of this era.